Zion National Park is Utah’s number scenic destination, and people come from around the word to discover the beauty of this series of sandstone canyons. Zion Park is 30 miles in length and 15 miles across and is essentially a flat plateau with deep canyons carved into the surface. Zion Crest Campground is found on top of Zion National Park’s plateau, literally on the eastern boundary of the park. One of the benefits of this location is that it is higher in elevation (6,500 feet / 1981 meters) and therefore much cooler during the warm summer months. 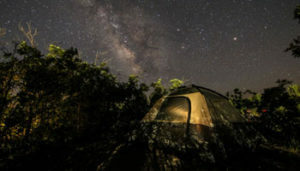 The clear skies above Zion Crest Campground are quite unbelievable and the night-time views of the stars and the Milky Way are nothing short of spectacular.